Snack Girl is a fan of The Biggest Loser on NBC. This program is a reality TV show with obese people who NEED to lose weight competing against each other for a monetary prize. Why do I like it? While the program is sensationalist (picture a lot of crying), it is also educational. The people on it learn about healthy eating and exercise and most seem to go on to healthier lives after the program ends. My biggest problem with The Biggest Loser is that the contestants get voted off. Why can't they all just stay and get healthy? They all seem so motivated to change their lives and it seems tragic when they have to go home. 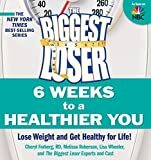 The Biggest Loser has become so BIG that it has become a franchise. There is a Biggest Loser Resort - and for $10,000 for 4 weeks you can go there and start your healthy life style. The advertisement says it is the most affordable program in the weight loss resort industry. 10 big ones isn't affordable for me! Some savvy people called Michelle and Rob started their own blog - Who Needs The Ranch because clearly we all can't be on the show or pay for the resort. Check it out for great ideas on how to create your own weight loss plan! 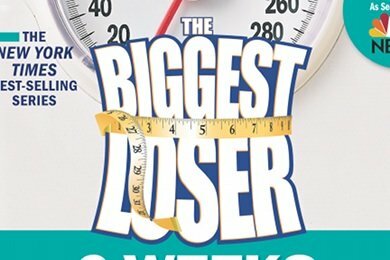 Finally, there are a series of The Biggest Loser books. The latest one is called, "6 Weeks to a Healthier You" and features 6 weeks of menus for weight loss. I got to meet Cheryl Forberg, RD, nutritionist for The Biggest Loser program, a few weeks ago to discuss the book. (I will do a post on our interview soon.) She sent me some signed copies of her book to giveaway and I am excited to do it. Why do I like the book? It features REAL food and exercise suggestions in an easy to follow format. Six weeks of menus is a great start to a healthy eating lifestyle and if you were to follow them, you would seriously change. It features whole foods and lots of yummy snacks that are low in calorie. You are going to HAVE to cook with this book. Honestly, I can't see how to have a healthy lifestyle without cooking. The recipes in the book are accompanied by fabulous photographs to entice you to make them. To enter to win the book, comment below about your favorite diet plan - add some entries on FaceBook or Twitter. I will count the entries and randomly choose a winner next week. This book giveaway is courtesy of Avocados from Mexico. Comment in the box below about your favorite diet plan. Comment on our wall about about your favorite diet plan. Anyone with a valid e-mail and a U.S. mailing address is eligible. The winner will be announced on July 14th, 2010. You will have 2 weeks to e-mail us back with your home address so we can mail the prize. Eating natural, fresh, God-made food is the best way to go ~ I avoid processed, prepackaged man-made food as much as possible. ummm... i don't have a "plan." and, thus, need one desperately. hahaha... pick me! My favorite diet plan doesn't exist! It's a mix of portion control and healthy choices. That's all I can do! A new plan that I could stick to would be great! Weight Watchers is my only plan! My plan and the only way to do it (I think) is to eat healthy and excersise! Pick me please! I guess my favorite dieting 'plan' would be the eat clean diet, I'm more of a figuring out what works for me type though. Eating small meals throughout the day and at least 30 minutes of exercise 4 days a week. Walking everywhere possible is a must! My favorite diet plan is cooking at home. Thay way I can control everything that goes into the food. My diet plan is just to try to eat as healthy as I can 90% of the time. I also try to make sure I get protein in every meal for staying power! I dont necessarily have a favorit diet plan. I prefere to promote living a healthy lifestyle. Lots of the healthy stuff like fruits, veggies, low fat dairy, and whole grains, and for some of the other foods you like chips, candy, soda, fatty foods, in moderation. Weight Watcher's works best for me. I also love to watch the Biggest Loser and the new show with Jillian Michaels. Very inspirational! I try to eat healthy and keep out all processed foods. Fruits and veggies and whole grains each day are crucial. Nothing like a good giveaway to get us lurkers to come out of our caves! I had the best results from the South Beach Diet several years ago. I've kept the weight off by eating more low glycemic foods. I also walk about an hour and fifteen minutes each morning, usually 6 days a week. I'm always looking for great healthy meal ideas! I try to eat as much whole foods as I can. Avoiding processed foods helps me stay and feel healthy.